1) Wie können Vulkanausbrüche, die jeweils nur einige Jahre lang kühlen überhaupt zu einer über mehrere Jahrhunderte andauernden Kältephase führen? 2) Ist es nur purer Zufall, dass die Sonnenaktivität während der Kleinen Eiszeit reduziert war? 3) Gibt es Rekonstruktionen der Vulkantätigkeit der letzten Jahrhunderte und Jahrtausende, die das LIA-Vulkan-Modell stützen würden? Abbildung: Globale vulkanische Aerosol-Aktivität während der vergangenen 2500 Jahre. Abwärtgerichtete Balkenlänge zeigt Stärke der Eruptionen und des kühlenden Vulkan-Aerosoleintrags an. Quelle: Sigl et al. 2015. Die Kreuze in der Graphik markieren die 40 stärksten Ausbrüche. Uns interessieren vor allem die Kleine Eiszeit (1400-1850) im Vergleich zur Mittelalterlichen Wärmeperiode (1000-1250 n. Chr.). Während der Kleinen Eiszeit gab es eine Reihe von Vulkanausbrüchen, jedoch bei weitem nicht in der Hochfrequenz und Intensität, um die lange Kältephase damit zu erklären. Interessanterweise gab es in der zweiten Hälfte der Mittelalterlichen Wärmephase eine ähnliche hohe Ausbruchfrequenz wie zu den vulkanisch aktivsten Phasen der Kleinen Eiszeit. Der Ausbruch um 1257 n. Chr. ist besonders bemerkenswert, da er möglicherweise das Ende der Mittelalterlichen Wärmeperiode markiert, in dem er dem sich durch sinkende Sonnenaktivität sowieso abkühlenden Klimasystem noch einen weiteren Kältestoß versetzt hat. Bei Durchsicht des Papers fällt auf, dass das 24-köpfige Autorenteam des Papers nicht einmal den Versuch unternimmt, die Kleine Eiszeit vulkanisch zu erklären. Die Kleine Eiszeit wird im Text mit keinem Wort erwähnt. Vielmehr beschäftigen sich die Autoren mit kurzfristigen Abkühlungseffekten, was sehr viel mehr Sinn macht. Dazu untersuchten Sigl und Kollegen die regionale Sommer-Temperaturentwicklung in den 5-Folgejahren nach den 24 stärksten Vulkanausbrüchen der letzten zwei Jahrtausende. Am Beispiel Europa ist das typische schnelle Absacken der Temperaturen und die allmähiche Rückbewegung gut zu erkennen. Bei den betrachteten besonders starken Ausbrüchen kann es durchaus 10 Jahre dauern, bis der klimatische Zustand vor dem Ausbruch wiederhergestellt ist. Researchers find new evidence that large eruptions were responsible for cold temperature extremes recorded since early Roman times. It is well known that large volcanic eruptions contribute to climate variability. However, quantifying these contributions has proven challenging due to inconsistencies in both historic atmospheric data observed in ice cores and corresponding temperature variations seen in climate proxies such as tree rings. Published today in the journal Nature, a new study led by scientists from the Desert Research Institute (DRI) and collaborating international institutions, resolves these inconsistencies with a new reconstruction of the timing and associated radiative forcing of nearly 300 individual volcanic eruptions extending as far back as the early Roman period. “Using new records we are able to show that large volcanic eruptions in the tropics and high latitudes were the dominant drivers of climate variability, responsible for numerous and widespread summer cooling extremes over the past 2,500 years,” said the study’s lead author Michael Sigl, Ph.D., an assistant research professor at DRI and postdoctoral fellow with the Paul Scherrer Institute in Switzerland. “These cooler temperatures were caused by large amounts of volcanic sulfate particles injected into the upper atmosphere,” Sigl added, “shielding the Earth’s surface from incoming solar radiation.” The study shows that 15 of the 16 coldest summers recorded between 500 BC and 1,000 AD followed large volcanic eruptions – with four of the coldest occurring shortly after the largest volcanic events found in record. This new reconstruction is derived from more than 20 individual ice cores extracted from ice sheets in Greenland and Antarctica and analyzed for volcanic sulfate primarily using DRI’s state-of-the-art, ultra-trace chemical ice-core analytical system. These ice-core records provide a year-by-year history of atmospheric sulfate levels through time. Additional measurements including other chemical parameters were made at collaborating institutions. “We used a new method for producing the timescale,” explained Mai Winstrup, Ph.D., a postdoctoral researcher at the University of Washington, Seattle. “Previously, this has been done by hand, but we used a statistical algorithm instead. Together with the state-of-the-art ice core chemistry measurements, this resulted in a more accurate dating of the ice cores.” “Using a multidisciplinary approach was key to the success of this project,” added Sigl. In total, a diverse research group of 24 scientists from 18 universities and research institutes in the United States, United Kingdom, Switzerland, Germany, Denmark, and Sweden contributed to this work – including specialists from the solar, space, climate, and geological sciences, as well as historians. The authors note that identification of new evidence found in both ice cores and corresponding tree rings allowed constraints and verification of their new age scale. “With the discovery of a distinctive signature in the ice-core records from an extra-terrestrial cosmic ray event, we had a critical time marker that we used to significantly improve the dating accuracy of the ice-core chronologies,” explained Kees Welten, Ph.D., an associate research chemist from the University of California, Berkeley. A signature from this same event had been identified earlier in various tree-ring chronologies dating to 774-775 Common Era (CE). “Ice-core timescales had been misdated previously by five to ten years during the first millennium leading to inconsistencies in the proposed timing of volcanic eruptions relative to written documentary and tree-ring evidence recording the climatic responses to the same eruptions,” explained Francis Ludlow, Ph.D., a postdoctoral fellow from the Yale Climate & Energy Institute. Throughout human history, sustained volcanic cooling effects on climate have triggered crop failures and famines. These events may have also contributed to pandemics and societal decline in agriculture-based communities. Together with Conor Kostick, Ph.D. from the University of Nottingham, Ludlow translated and interpreted ancient and medieval documentary records from China, Babylon (Iraq), and Europe that described unusual atmospheric observations as early as 254 years before Common Era (BCE). These phenomena included diminished sunlight, discoloration of the solar disk, the presence of solar coronae, and deeply red twilight skies. Tropical volcanoes and large eruptions in the Northern Hemisphere high latitudes (such as Iceland and North America) – in 536, 626, and 939 CE, for example – often caused severe and widespread summer cooling in the Northern Hemisphere by injecting sulfate and ash into the high atmosphere. These particles also dimmed the atmosphere over Europe to such an extent that the effect was noted and recorded in independent archives by numerous historical eyewitnesses. 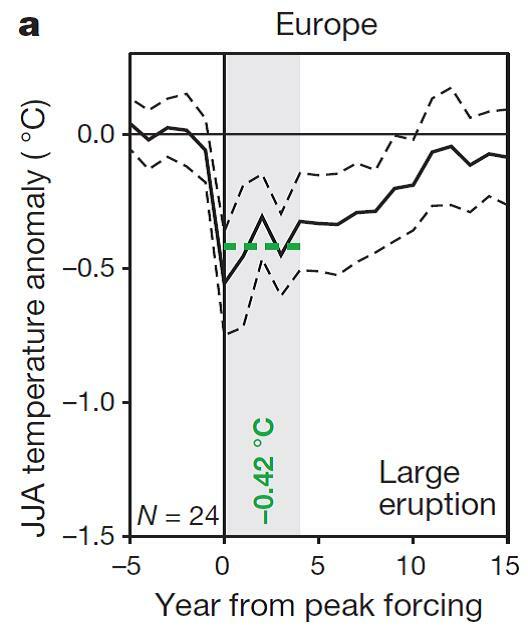 Climatic impact was strongest and most persistent after clusters of two or more large eruptions. The authors note that their findings also resolve a long-standing debate regarding the causes of one of the most severe climate crises in recent human history, starting with an 18-month “mystery cloud” or dust veil observed in the Mediterranean region beginning in March, 536, the product of a large eruption in the high-latitudes of the Northern Hemisphere. The initial cooling was intensified when a second volcano located somewhere in the tropics erupted only four years later. In the aftermath, exceptionally cold summers were observed throughout the Northern Hemisphere. This pattern persisted for almost fifteen years, with subsequent crop failures and famines – likely contributing to the outbreak of the Justinian plague that spread throughout the Eastern Roman Empire from 541 to 543 CE, and which ultimately decimated the human population across Eurasia. “This new reconstruction of volcanic forcing will lead to improved climate model simulations through better quantification of the sensitivity of the climate system to volcanic influences during the past 2,500 years,” noted Joe McConnell, Ph.D., a DRI research professor who developed the continuous-flow analysis system used to analyze the ice cores. “As a result,” McConnell added, “climate variability observed during more recent times can be put into a multi-millennial perspective – including time periods such as the Roman Warm Period and the times of significant cultural change such as Great Migration Period of the 6th century in Europe.” This reconciliation of ice-core records and other records of past environmental change will help define the role that large climatic perturbations may have had in the rise and fall of civilizations throughout human history. “With new high-resolution records emerging from ice cores in Greenland and Antarctica, it will be possible to extend this reconstruction of volcanic forcing probably all the way back into the last Ice Age,” said Sigl.